UK Economic Performance since 1997: How bad was Labour? And what are the implications for restoring growth? !! This event is now fully subscribed !! Overview: A commonly held view is that the performance of the UK economy after 1997 was poor and that the UK’s current economic problems are largely the consequence of Labour’s bad economic policies. 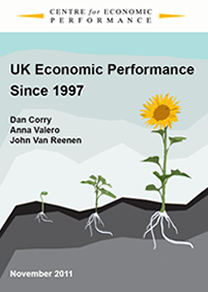 At this event we launch a new report that re-assesses UK economic performance during the Blair/Brown years, focusing on productivity and other key measures of business performance. We find that the UK’s overall economic performance after 1997 was better than commonly thought. In fact, the UK had the fastest growth of output per person of the G6 major economies between 1997 and 2010. We argue that the UK experience during the Great Recession does not imply that pre-crisis performance was purely illusory. Britain needs to combine a medium term plan for debt reduction with a short term stimulus (“Plan B”) and a long term growth strategy (“Plan V”). We offer a sketch of what such a growth strategy could look like.